I love them and so does Haila! Very cute, Anna!!! This is such a super cute and easy top! And adorable on your girls! What a darling cardigan and pictures of your girls! I’m totally making one soon. Thank you!! That is way cute! I’ll have to make a couple for my girls for Christmas now! I’m excited by how completely easy and super-clear this little pattern is. As someone who’s often intimidated by apparel, I can see exactly what to do. What a great place to start with knits! And – as always – your girls are awesome little models! sweet and simple. I love it! what a sweet, simple project. I love it. you are a genius and your girlies are so stinkin’ cute! Too cute. I think it would even work on one of my old t-shirts, as an update. What great photos of your girls! Thanks for the tutorial. I’ll have to make one for my niece. nice pictures. I’m going to make one for my girl, thanks for sharing. So gorgeous and simple! Pinned it to pinterest and making it this weekend! Great little pattern/tutorial. Super cute models too. Thank you for the tute and pattern pieces too. What a great little project/tutorial! And there are so many ideas for customizing this running through my head! These are so simple, Anna, but they look fantastic. I love the bright colors. Such a cute little cardi (and OMG, such cute little girls!)! Super cute and I still need to make some gathered clutches. Maybe for Christmas. I love this idea! Can’t wait to link up to the site and your designer profile. Thanks for sharing! Do you have any ideas on how to convert this to an adult size pattern? 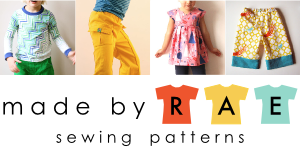 You could find an adult size raglan tee and trace the front/back/sleeve pieces…. These are adorable! But I am wondering, are the sleeves and bottom edge left raw? Or are they hemmed or something? Thank you!